Joseph Rudyard Kipling was born 150 years ago today in Bombay, India, to a cultivated English family of artists and academics. After an often unhappy childhood at school in England, he returned to his beloved India where he worked as a journalist, short story writer, and author of light verse (including the original Barrack-Room Ballads). From 1889 onward he lived for various periods in London; Brattleboro, Vermont (where his American wife’s family lived, and where he wrote the juvenile classics The Jungle Book and Captains Courageous); and then in Devon and Sussex in England; all the while traveling extensively in the Far East, North America, and South Africa. By the turn of the century, age 34 or 35, he is said to have been the most highly paid writer in the world. Also one of the most famous personalities, friend to Mark Twain, Arthur Conan Doyle, and Henry James (who had gladly stepped in to give the bride away when Rudyard Kipling married the New England lady Carrie Balestier in London in 1892). In 1899 he wrote a poem that became the theme song to the Boer War, “The Absent-Minded Beggar,” set to music with a tub-thumping marching tune by Sir Arthur Sullivan (who at this point had definitively ended his partnership with W. S. Gilbert). If you don’t know the song, just read a few lines and the probable melody will suggest itself—because Kipling verse is like that. For a gentleman in khaki going south? A century and more after his heyday, Kipling’s imagination still surrounds us. We can’t escape him. Recent years have seen a movie version of John LeCarré’s espionage classic Tinker Tailor Soldier Spy with Gary Oldman and Benedict Cumberbatch. (The novel had already been adapted—many people would say far more successfully—in the 1979 BBC series  with Alec Guinness, now freely available on YouTube. ) Whichever version you like, Tinker, Tailor was loosely based on the career of Soviet double-agent Harold Adrian Russell “Kim” Philby, of MI6, the KGB, The Economist, The Observer, and The Times of London. There has also been a bestselling biography of Kim Philby and his MI6 associates, by Ben Macintyre, called A Spy Among Friends  (2014). Of making Kim Philby books and films there is no end. But the basic point here is that Kim Philby— his nickname, his profession, his drive and outlook—all derived from the imagination of Rudyard Kipling, the first writer to popularize the notion of “The Great Game,” or espionage. Phiby’s father, Harry St. John “Sinjin” Philiby, nicknamed his son Kim after the character Kimball O’Hara in the enormously popular juvenile novel that Kipling wrote 1900–1901, Kim. The fictional Kim, based on Kipling’s youthful friends and peers in the India of the 1870s, was an Irish boy from a British Army family fallen among hard times while serving in the Raj. Young Kim had “two sides to his head”—loyalties to the Raj, and government and order; but also a psychic kinship with the Moslems, Hindus, and Parsees he had grown up around, and whom he regarded as his primary, albeit not ancestral, friends. Both Kim Philby and his father (a longtime friend of Ibn Saud who converted to Islam) highly identified with the Kipling character. Both were devoted to “The Great Game,” or espionage; another phrase popularized by Kipling. Before anyone else conceived the expression, “going native,” Sinjin Philby and his son Kim were right there—identifying with and declaring their loyalties to the Third (or Fourth) World. A sense of panic and despair rule much of Rudyard Kipling’s work. It’s as though he saw the future that ensued upon the colonial experience of the 1860s–1890s, and he did not much like it. Poets and other artists, Ezra Pound famously wrote , “are the antennae of the race.” So perhaps Kipling, a poet of the Raj and the British Empire, was also a prophet and analyst of the Empire’s doom. George Orwell tried to analyze this paradox in a famous Horizon essay  on Kipling in 1942. Orwell loved Kipling, but in his world it was not politically correct to admit such a thing. Like Kipling, Orwell himself was a child of the Raj, having been born to a prosperous civil servant’s family in Calcutta. He adored Kipling, grew up on his writings, and defended him against accusations of “fascism” on the feeble grounds that Kipling was proto-fascist, a hopeless naïf! But make no mistake about it. 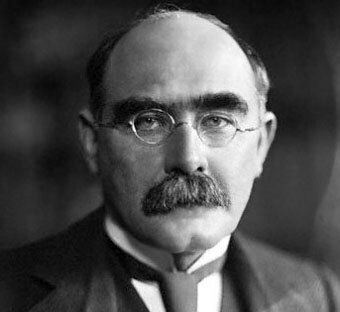 Rudyard Kipling was not a prophet of the Raj, or the decline of the British Empire, or a fascist. He was merely an everyday artist who dealt with daily despair about the pointlessness of existence, but kept on producing because he sensed that despair itself was merely one more funhouse-mirror distortion. It’s a very dark poem, so I recommend the whole thing to anyone suffering from ennui or depression. Here is the opening stanza. It gets worse and worse afterwards, I guarantee you. Scary, bracing stuff!